As the country hosting the 2014 Climate Change Conference, Peru ambitiously lifted its renewable energy target for 2018 to 60% of total electric power output. The thinking behind that move was the need to prepare for depletion of Peru’s gas reserves and make its hydroelectric plants less vulnerable to climate change. Peru ranked near the bottom of the Human Development Index in 2000, but has since experienced a “golden decade.” Between 2003 and 2013, GDP grew by better than 6% a year on average. And while growth has slowed recently, Peru still boasts one of South America’s most vibrant economies. From an energy standpoint, this has made electric power increasingly available to the population. The level of coverage rose from 45% in 1990 to over 91% in 2015. During the same period, however, energy consumption surged by nearly 80%, and the trend shows no signs of abating, either. The government expects demand to increase 10% a year until 2019. This highlights the urgent need to boost production capacity. JUST 2% OF POWER COMES FROM SOLAR AND WIND FACILITIES Peru’s electricity generation capacity is evenly divided between hydroelectric and geothermal sources; the country produces natural gas. Solar and wind power account for less than 2% of the national energy mix, although Peru has substantial, as yet unexploited renewable resources. For example, its wind power potential has been estimated at 22,000 MW – compared with installed capacity of 142 MW. To make the most of this asset, the government has introduced legislation that is highly supportive of investment in electric power from renewable energy sources (biomass, wind power, geothermal power, tidal power and hydropower). The private sector currently covers 70% of total renewable energy investment. In connection with the COP21 conference, Peru committed to a 30% reduction of its greenhouse gas emissions by 2030. In 2015, Proparco extended a $10m loan and a $19m loan to the companies Parque Eólico Marcona and Parque Eólico Tres Hermanas (a Cobra Group subsidiary) to build and operate two wind farms in Nazca Province. Through a joint financing facility with its German and Dutch peers, DEG and FMO, Proparco mobilized a total of $69m for the two projects with an aggregate cost of $335m. Additional support came from Corporación Andina de Fomento (CAF), which provided $20m, Natixis and Exim Bank US. This is the second renewable energy project in Peru supported by Proparco after T-Solar in 2011, the country’s first large-scale solar power plant, with capacity of 44 MW. VOTED BEST RENEWABLE ENERGY PROJECT The 32 MW Marcona facility came on stream in May 2014 as Peru’s first wind farm. Together with Tres Hermanas, a 97 MW facility commissioned in January 2016, it forms the country’s largest wind farm. Thanks to the two wind farms, 428,000 tonnes of CO2 equivalent emissions will be avoided a year. Their entire output will be sold to the national power grid. 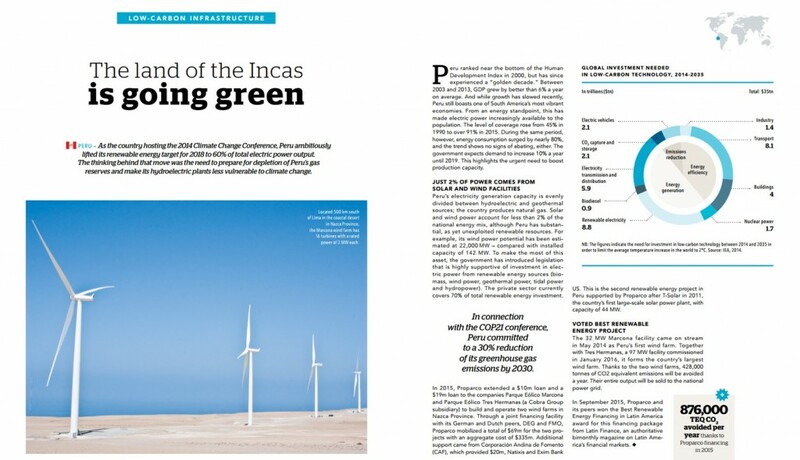 In September 2015, Proparco and its peers won the Best Renewable Energy Financing in Latin America award for this financing package from Latin Finance, an authoritative bimonthly magazine on Latin America’s financial markets.